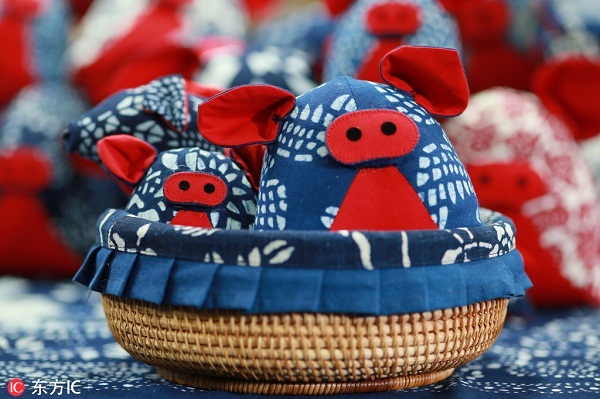 As the Year of the Pig draws near, the Blue Calico Museum in Nantong, East China’s Jiangsu province, has released a series of vivid pig mascots made of blue calico cloth to welcome the new year. In traditional Chinese culture, the pig represents harvest and prosperity. The various pig mascots have attracted many visitors. The mascots were designed by the museum's curator, Wu Yuanxin, and his team. Wu is among the first batch of representative inheritors of State-level intangible cultural heritages and head of the Blue Calico Cloth Art Institute at Nantong University. Nantong blue calico cloth was listed as a national intangible cultural heritage in May 2006. The city has become a hometown and inheritance base for the traditional craft.